I love journals. I mean in the “oooh look at all the awesome journals!” sense when I’m standing in a bookstore or specialty gift shop, especially when I see the leather wrapped ones with the cool buckles or string closures. I love the way the leather feels and smells, and I love unique paper, especially the handmade stuff with imperfections, color variations, and uneven edges. I like to hold them and open them up and just feel the paper and imagine what kinds of things I would write in them. I want to buy them all because something in my brain gets excited; standing in the store I always feel like I could actually be faithful to keeping a journal and writing down the little things I think about and do each day so that one day when I’m old and losing my memory I could look back through them and read about my life. Or someone could read it all to me, you know, like in “The Notebook”. But I have this tiny weakness that prevents me from collecting them – I won’t use them. If I buy all the journals I see that I love, I will one day have a big shelf of beautiful journals giving my children the impression that opening them after I’m gone will invite them into a private world of thoughts and dreams, and secrets that they might not otherwise have known about me. And all they would see is empty pages, book after book, which would probably make them shake their heads at the money I spent collecting journals I never used. Although that in itself might tell them something about me. I know Kate would save them anyway, because she’s like that – nostalgic and sentimental – and they would be useful to her someday I’m sure since she will undoubtedly have more adventures to write about than I ever had! At the very least she would have a nice shelf with beautiful journals. I have on a few occasions set out with great intentions to commit myself to keeping a journal. I started one when the kids were very small, noting their cute ways of saying and doing things, precious moments, words they made up and what they meant. I wrote a bit about being their mom. I even took the time to write at the beginning what my intentions were and that later in life the journal was to be duplicated so that each could have a copy for themselves. I think there might be about ten pages at most; the last entry is probably from about 1989 and my kids are now grown into adults. I have another that I bought when I took a big trip several years ago, because I had spoken to an older lady who had regularly kept a diary of her days and once, when she got sick and had a memory lapse for a period of about three days, she was able to look back at her diary and remind herself what had happened leading up to and during that period. I thought that was a wise idea, so I kept close track each day on the holiday and wrote down things about my activities, funny things that happened and were said, and came home committed to continuing it. It’s a special leather bound one that has a pen holder and I can even buy refills for it. Let’s just say there are big gaps (because that’s the best way to say I didn’t follow through and actually forgot about writing in it – forgot I even had it at one point – and I have the two refill books I searched high and low to find, still in plastic wrap). I have two – yes, two, because I have two children – “From a Mother’s Heart” books to write in so that when I’m gone my kids can read about all the many details of my life that possibly haven’t come up in conversation over all these years (could you imagine there would be anything like that left to say? ), or at least have them in writing somewhere for them to refer to if the details fade in their minds. They are, at best, works in progress. They seemed like a good idea at the time, but once again, my commitment to follow through lasted exactly long enough to track down and special order the second one from another store before I started the first (I had to know there would be two) and choose specifically which pen I would use to write in them (I’m picky that way), only to be challenged by the question of how to relate the same ideas and memories to each child without using exactly the same wording! I love to plan and think about doing things like this; unfortunately, the plans are rarely helpful in actually getting started. When I have set out to start a new journal, I’m always delayed by thoughts of how to start because I can’t help thinking of all the things I haven’t written down already, and the fact that if I actually persevere with this one there will be so much missing that I would have wanted it to contain, being the one journal I actually leave behind with something lasting in it. In the end, I’m my own worst enemy. The only journal I’ve been faithful to keeping is the one I started when Pat had his accident and it wasn’t even my idea. It was suggested to me by a couple of people and I went with it, and it served many purposes, including becoming the foundation for this blog. It was a way for me to keep things organized in my head and I’m very grateful that I did it. It’s been my desire for a while now to get back to actual letter writing, you know, doing things the old fashioned way. If you’ve read some of my other posts you’ll know that I’m kind of attracted to the olden days, the vintage style, and a sense of the traditional. I was a big letter writer in my youth and I enjoy getting actual mail. I love technology and the ease of texting and emailing (partly for convenience and partly because I’m an anxious introvert who prefers to write and rewrite things before actually communicating them to someone else because all the words have to be just right, and talking on the phone doesn’t allow for autocorrect or “did you mean this instead of this?” and writing on paper just doesn’t have the same appeal with all the whiteout because I tend to wonder if people actually turn the page over to see what I was trying to hide). But I also miss getting real mail and I think I have to start somewhere in getting the ball rolling so that the art of letter writing and sending cards to people “just because” doesn’t completely die on the hill of convenience and economic decisions – we all know how much stamps cost, but can you put a price on the little jolt of anticipation we get when we open the mailbox and find an envelope without a window? To that end, I succumbed to a sales pitch and a display of lovely modern fountain pens at a cool shop at the Lonsdale Quay market while I was on a recent holiday (I should say here that they also had beautiful journals, but unfortunately the ones I liked had the handmade paper which wouldn’t work with a fountain pen and because I compartmentalize things like this, it wasn’t the time to be drooling over something I probably wouldn’t use, especially with the new pen I was trying to convince myself to buy). I tried it out and it felt good when I was writing with it. I’m a real Bic crystal pen fan, have been for years, but this, THIS was something special. Trying it out reminded me of the days when my grade six teacher insisted that we all use fountain pens because it made a difference in the quality of our handwriting. I didn’t appreciate the coolness of writing with a fountain pen at that time – of course, if you insist I do something it takes the fun out of it – but in my teens I used one off and on until the novelty eventually wore off (either that or I just got tired of having to buy cartridges because when you’re a teenager certain things aren’t worth the effort and quality handwriting costs money). 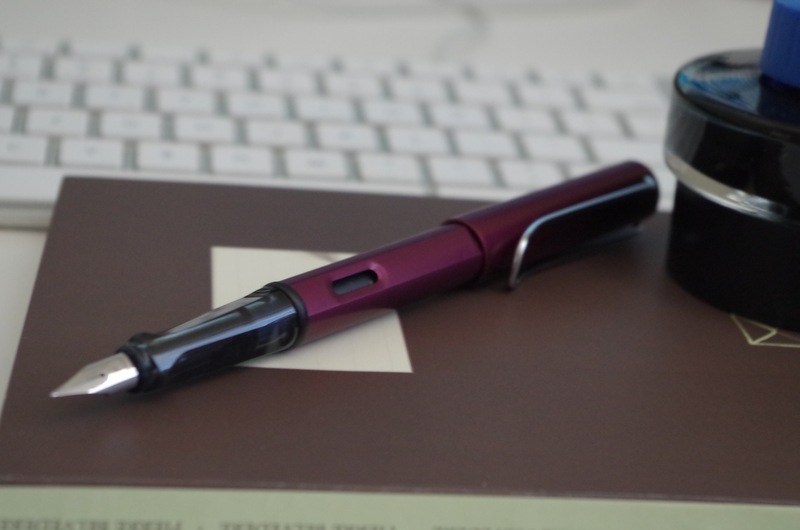 However, I have a strong practical sense and I don’t easily make decisions about purchasing unnecessary things, the category into which this fountain pen fit. So after a long deliberation with myself (and with Kate who patiently waited while I hemmed and hawed), I said I would walk around and think about it. Often this works to change my mind and I end up knowing I didn’t need the item so I’m glad I left it behind. In this case, I was almost there – we were finished doing what we went to do at the Quay, and we were enjoying a last look out over the water before catching our bus. Standing there in that place, which was always a favourite of Pat’s on our holidays, brought, in just a few seconds, many thoughts to mind of him, of how quickly and drastically life can change, and of how in the midst of practicality it’s sometimes important to indulge in things that make you happy while you still can, and my sudden thought was “Life is short; buy the pen.” So I went back and grabbed it, along with a bottle of ink to refill it as I go, and I happily left with my new system of getting back to something old. I’m strangely excited about my new fountain pen and looking forward to using it as soon as I can. It doesn’t take much to make me happy and often the little things have a bigger effect than one would think. And if you scroll back up now and really take a good look at that pen, I’m sure you’ll agree it’s a fine looking thing. I still have to find the little journal with the right paper for the fountain pen ink, but until then, I have some letter writing to do!